Question: My Mercruiser Marine Engine suddenly started overheating to the point I’m afraid to run the engine. I watched your video on replacing the water pump impeller and in fact narrowed my problem down to a failed water pump impeller on my 807151A14 water pump impeller. However after replacing the impeller the engine is still overheating. Did I miss something when replacing the water pump impeller? Response: This is a very common situation however its very important to understand why. This is probably one of the most common situations a marine mechanic faces while addressing marine cooling system related problems. It can be described like the chicken and the egg scenario regarding whether the failed impeller causes the overheat or the lack of water flow/overheat causes the impeller to fail. Regardless of which happens first the result is always the same; a failed water pump impeller. Situation 1 – You’ve been running all summer while noticing your temperature slowly climbing over the course of the days/weeks. Ultimately you reach a point where the engine overheats and you can no longer run. 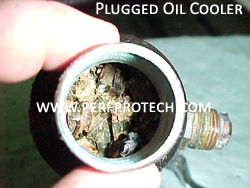 The image below illustrates an oil cooler that has become plugged with grass, weeds, trash, or some other kind of foreign debris. This typically comes as a result of operating in an environment where grass or weeds are common, however it can also be attributed to picking up a plastic bag over the water intake on a sterndrive. It is important to know the operating conditions of the area you operate within so you can schedule your maintenance in accordance with this. In the case described here it is likely that the cooler became plugged over a period of time which lead to the slowly increasing engine operating temperatures. Ultimately this can lead to impeller damage from the lack of sufficient water flow until the impeller ultimately fails. It is important that you inspect all of your coolers each season when performing your normal winterization maintenance, or if you live in an area where you do not winterize you should schedule time each year while inspecting the water pump impeller to also inspect the coolers for blockage. Situation 2 – You’ve been running all season long with no apparent temperature related issues. All of a sudden your engine overheats and forces you to shut down. After inspection you determine the water pump impeller has failed. Its important to realize how a positive displacement pump functions and displaces/pumps water. These pumps move water by creating a pressure displacement (low pressure) on the inlet side of the pump while then producing positive pressure on the outlet side. This process in effect then moves water. These pumps commonly have a pliable, rubber impeller that has an offset section which compresses certain veins of the impeller to create the pump suction. If the internal surface of the pump body becomes grooved or anything other than smooth the impeller loses efficiency and therefore loses its ability to move water. In this case with a rubber impeller the pliable material of the impeller which cannot absorb heat tends to break down therefore becoming less pliable to the point that it actually becomes brittle much like when you burn a piece of rubber and it becomes hard. At this point it is like a self-perpetuating condition in which the increasing heat is leading to further breakdown which then continues to decrease the performance of the pump until failure results. Whats important to realize in this case is that many of the broken/missing pieces of the failed impeller get trapped somewhere in the cooling system and cannot exit the system. While this is a more common of a problem on closed cooling engine or any engine equipped with an engine oil cooler it can also lead to problems on raw water cooled engines NOT equipped with any coolers. Conclusion: Whether you have an impeller fail which then leads to overheating or you have a blockage in the cooler that leads to impeller failure you should always check the complete inlet and outlet flow paths to ensure there is nothing blocking the system from good water flow into and out of the water pump.